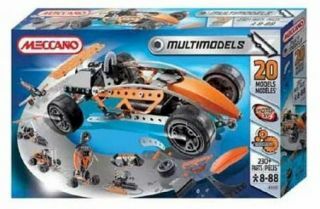 Meccano 20 Models Kit is a classic building or construction kit using metal pieces, nuts and bolts and some plastic components. It has 230 plus parts including a 3V motor, with detailed assembly instructions for 7 models and another 12 available at www.meccano.com. Tools are included. For ages 8 - 88.